Jean (1953): After an engagement of a year, we were ready for the big day—our marriage in 1953! My mother, mother-in-law, and I travelled to Philadelphia, Pennsylvania to shop for the dress. It did not take long to find the dress of my dreams—white Chantilly lace over satin with illusion neckline and collar trimmed in lace, long sleeved. A cap of matching lace held a fingertip length veil. The cap, collar and bodice are all trimmed with seed pearls. In the back covered buttons reach from the neckline past the waist. The skirt back includes a chapel train. After the wedding and honeymoon, I packed the dress, cap and veil in its original box. It was carefully wrapped in royal blue tissue paper and a layer of the Sunday comics dated 1953. The comics were to fill out the box. Finally, the box was tied with a ribbon. One year before our thirtieth anniversary, my daughter Jennifer was making plans for her wedding. She chose to wear my dress and cap. She told me she had always wanted to wear the dress when she married. Over the years the white dress and cap had turned a soft ivory shade and a new ivory veil was attached to the cap. Amazingly, all buttons and the seed pearl trims were all present. She was a beautiful bride. Now in 2012 the dress and cap are one year shy of sixty years. It hardly seems possible the fabric and workmanship of this now vintage dress has held up over the years. My granddaughter Jessica has chosen to wear the dress and cap for her wedding! It is still a soft ivory and she, with the help of a special seamstress, has made some changes to the dress. This is a lovely creation for a lovely bride. Once more it’s time to wrap and box the dress and cap and add one more set of the Sunday comics (now 1953, 1982, and 2012) to the box. Jennifer (1982): On my parent’s tenth anniversary in 1963, my mom surprised my dad by putting on her wedding dress. Even though I was only four years old, I remember thinking she looked more beautiful than anyone I had ever seen. We all got to try on the cap and veil including my two-year-old brother! As I grew older and became more fascinated with weddings and marriage I kept telling my mom I wanted to wear her dress. She would say very diplomatically that would be fine, but I needed to wait and see how I felt when I actually was getting married. I never changed my mind. I’m not sure if I was the most beautiful woman in the world, but I felt like it especially when my three-year-old stepson looked up at me at our wedding in 1982 and said, “You look like a beautiful angel!” It meant the world to me when my daughter Jessica wanted to wear the dress for her wedding in 2012. I believe she was the most beautiful of all! Jessica (2012): It was my grandmother’s wedding dress first. Then, thirty years later (give or take a few), my mother’s. Now it is mine, but truly it is ours. The dress’ beauty speaks for itself, but the emotional ties to it were overwhelming. Wearing the dress was a symbol of their example of lifelong partnerships, a banner I proudly hope to live up to. We had few alterations, but even the changes turned out to be a blessing. Every inch of the dress was saved and used, thanks to a careful seamstress, a handy bridesmaid, and our combined sentiment. Trying on the dress in its new, slightly different form for my grandmother the first time made all of us gasp and tear up, in that wonderful joyous way. On the day of the wedding, when I put on the matching lace cap that both of them had also worn, I broke down. My dad, temporarily misinterpreting my tears, said, “You don’t have to wear the cap if you don’t want to sweetheart!” I laughed and let him know I wasn’t crying because I had to, but because I got to. My mother and grandmother made it clear to me from the beginning, that they didn’t expect me to wear the dress and would gladly buy me a new one; but when I explained the reasons I wanted to, they eagerly helped me try it on just days after I got engaged. It was about tradition, and lifelong marriages, and honoring the beauty of both my mother and my grandmother. 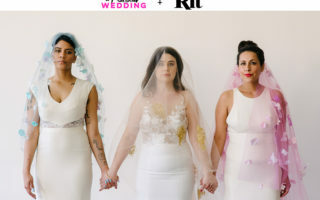 It was about showing everyone else that what I wore on the outside was meant to represent the intimate connection I have with both of them, the respect I have for the women they were and are, and the successful marriage I hope to have with my husband. I admire both of them so fully; wearing the dress was one way of showing that. 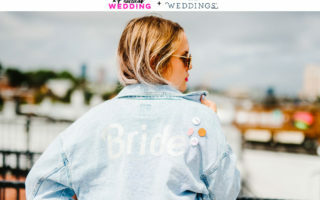 What we wear on our wedding day can be such a struggle for so many people, and the options are so vast that it can be overwhelming to try and choose. I didn’t have to choose. My grandmother did, sixty years ago. And my mother after her. I hope they know that I felt as beautiful as they both looked.